Ben and his wife, Corey, and their two boys, Case and Avery, have been farming in Wonewoc for 7 years. He grew up in Sandusky, OH, spent some time working in a sheriff’s department, but was always brought back to farming where he “felt most at peace with the Lord.” Their farm, Shiloh Farms, is indeed a peaceful place. It is clean, well-kept, and has an amazing tree house and swing set off of an old rambling pine tree in the front yard where the children can be seen playing. It seems a perfect place to be a child. And a perfect place to grow small grains. John Wepking, Meadowlark Organics. Ridgeway. John grew up on a farm outside of Lancaster, went away, met his wife Halee in a restaurant in New York, and came back to the Driftless Region with great food on his mind. 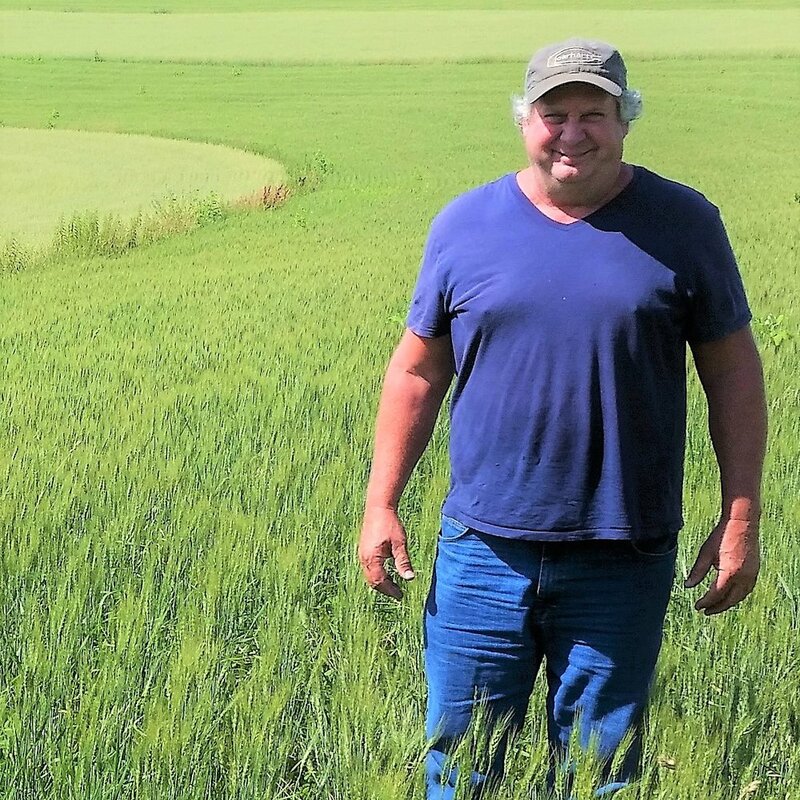 Paul Bickford wanted to pass on his legacy, and in 2014 these two families came together and now John is managing Paul's beautiful land high on the ridge where they look forward to growing an increasing variety of heirloom grains. The enthusiasm, knowledge and dedication they share is inspiring. They look forward to building a new certified organic grain cleaning shed on their land in the next year. Dennis's family has been farming on his land for over 100 years. He is the fourth generation to honor the land at Scenic Height Farm, which was named by his parents. He grew up believing that minimal inputs were needed with careful growing practices, and in 2010 he became certified organic. When asked what he might want people to know about him, he paused, laughed, and said with a shrug, "I grow a lot of grains for Gilbert!" Dennis enjoys the variety inherent in a farming life, There are so many different things to do, always; fencing, planting, harvesting, hauling manure, feeding cattle, it is ever changing. And it is good. 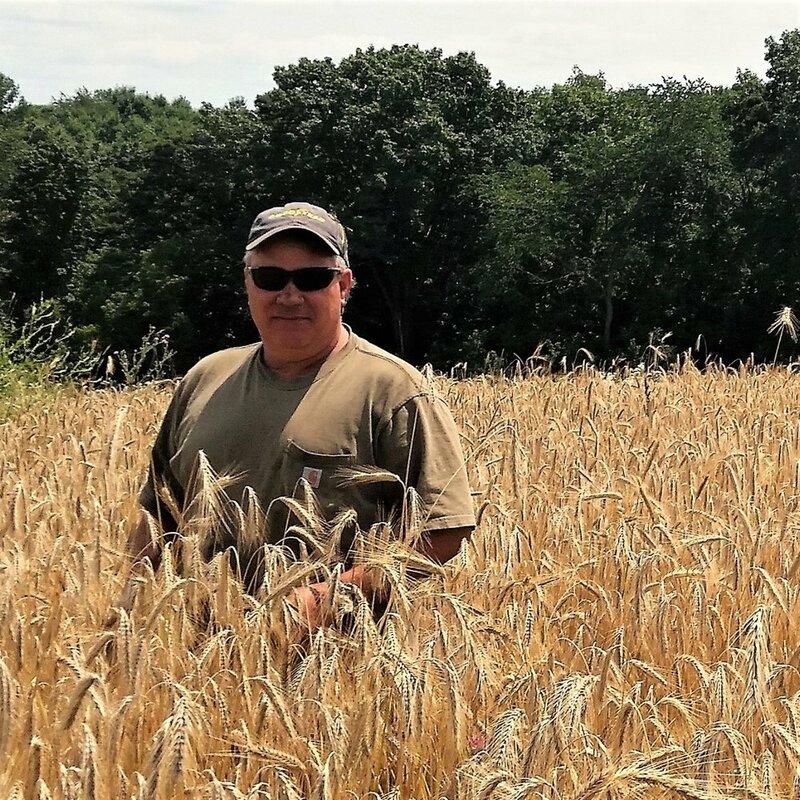 Dave Dolan was one of the first farmers to grow grains for Lonesome Stone Milling in 2009. His farm, Dolan Farms, is on a high ridge in Iowa County, north of Dodgeville. From his fields he has a view far to the southwest of the windmills in Monfort, and to the east of Blue Mounds. One feels on top of the world there. Dave grew up in a large farming family and, while he tried working off farm, he found that his destiny seemed to be tied to the land, and he returned to purchase the farm from his father. He speaks of his fields, his cows, his woods and his land with a quiet calm that belies the hard work he puts in every day. He clearly loves what he does, saying, “it just feels right.” He has hosted nieces and nephews for countless summers, passing on his knowledge and his love of the land to the next generation. When asked what he likes about working with Lonesome Stone he quickly speaks of his high regard of Gilbert and his business model, and his focus on local food from local farmers.